The immediate beach area is about 95% complete, so I’ve started to move further in-land. I’ll work all the way to the Monorail station, then probably move onto the raptor canyon in Industrial Jungle, which should cover most of the visual style of the islands south. To answer the first comment before its even posted.. Yes, I’m well aware the smaller vegetation species are not visible in the distance. This is not noticeable in-game when you’re walking around, it’s only when flying around in the editor. 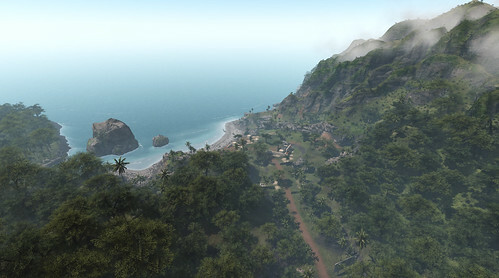 The added height robs some of the draw distance. ~ by newoldmate on 28/05/2015. Morning! Have been following your blog for quite a few years now. Absolutely love it. Big fan of JP and trespasser franchise. Got hooked on TP right from the very beginning. 1997 I think it was? Graphics being amazing and AI smart as Hawkins 😀 Played it through a few times since. Your piece looks great and I really hope it materializes in full at some point. And keep those posts coming! It’s great that you haven’t given up on this over the years and dramas you seem to have been having. Thumbs up!! PPs: I got a sense from somewhere that you might be Aussie? True? I’ve been travelling here since mid 2013. This looks awesome! 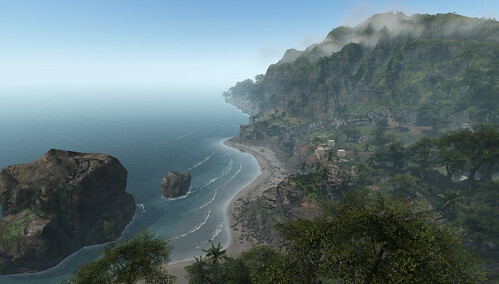 What I really like the most is how you went for a wider starting beach instead of that tiny inlet in the original game. 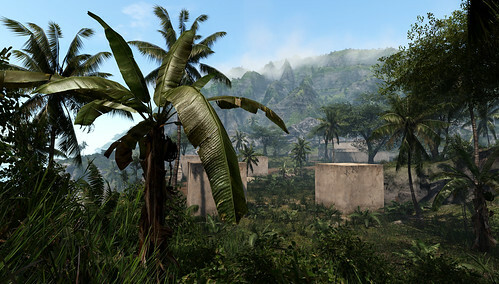 I especially love the scenery, its looking more like a jungle every day! To tell you the truth, before seeing your mod I hadn’t even heard of Trespasser. So in a way it’s because of your mod that I’ve become a fan! It’s also given me some great inspiration for my JP fanfiction that I’m writing, it’s easier to describe a scene in a story if you have an actual image that you can base one on. So thanks for this awesome mod and keep up the excellent work! My God… It’s full of…reptiles! Feel free to add more aircraft debris! I always thought it was a bit cheesy that you, and a clean-cut under-sized tail portion of the plane survived. In Trespasser, the plane crashes into the ocean. Why the plane tail washes up is a bit of a mystery, but ill be covering it in a new introduction sequence. Not exactly new, just a more elaborate version of the original. So are you no longer going with the idea of a larger hotel foundation? I liked the look of the tall columns out in the water.